In January 2012, the North Carolina Department of Transportation (NCDOT) released the I-95 Corridor Planning & Finance Study which identified tolling as the most feasible means for funding future improvements of Interstate 95 (I-95) in North Carolina. 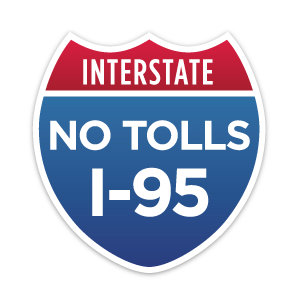 The No Tolls I-95 Coalition of North Carolina is strongly opposed to the imposition of tolls on I-95. Since its creation, the Interstate System has been financed under the philosophy that roads should be funded primarily through fuel taxes not tolls, and tolling (other than on interstate segments that pre-date the establishment of the Interstate System in 1956) is limited to the reconstruction or replacement of interstate bridges and tunnels. In 1991, Congress created a pilot program that allows tolling on existing interstates in urban areas for the purpose of reducing congestion through time-of-day pricing. So far, no existing interstate lane – other than HOV lanes – has been tolled under this program. In 1998, Congress authorized three toll pilot projects, one in each of three states, on the Interstate System. To date, none of the three projects has been implemented. Toll collection requires a large and extremely expensive bureaucracy as well as capital, operational and enforcement costs. On major toll roads, toll collection costs are as high as 22% to 30% of revenue. Even on newer toll roads that utilize the latest technologies, collection costs are significant compared with the federal fuel tax, ranging between 12% and 20% of revenue. While many see tolling as a way to avoid raising taxes, tolls are taxes and imposing them is certainly not an efficient way to finance highways. Because trucks and passenger vehicles already pay state and federal highway fuel taxes to use I-95, the NCDOT tolling proposal would actually tax people twice to use I-95. As with any state tax policy, the authority should remain with the legislature not unelected bureaucrats. Although trucking companies will not be able to pass along 100% of their toll costs to serve Eastern North Carolina, they will pass along as much of the toll costs as they can. The result will be higher shipping costs for industries and businesses located in Eastern North Carolina to receive raw materials and ship their finished products. North Carolina already has one of the highest gas tax rates in the Southeastern United States at 38.9 cents per gallon. Tolling I-95 would drive up transportation costs even further and act as a deterrent to locate along the I-95 corridor for any company with a distribution component. This will put this region of North Carolina at a disadvantage in attracting new businesses and industries to provide much-needed jobs for the area’s citizens. Essentially, unelected bureaucrats at NCDOT would be selecting winners and losers in the all too competitive field of economic development. Imposing tolls on I-95 will cause traffic diversion to local roads less suited to handle higher traffic volumes. North Carolina estimates that tolling their portion of I-95 with result in diversion of 30% of traffic to other roads, including US 301, I-85 and other state roads. The 30% diversion rate represents the loss of 12,000 cars along I-95 per day, which would have a devastating impact on businesses and tourism located along the I-95 corridor. The increased traffic diversion would also pose substantial public safety concerns, especially for fire and safety response times. In emergencies minutes can make a difference, and there is no doubt that a 30% increase in traffic would substantially affect their response time. Imposing tolls on I-95 will create two classes of drivers, those who can afford to pay a toll and those who cannot. Many residents of Eastern North Carolina, particularly low-income residents, will be economically prohibited from using a road that their highway user taxes paid to build. While the national unemployment rate hovers around 8%, the unemployment rates in some of the counties whose citizens and businesses will be most affected by NCDOT’s I-95 toll plan are: Wilson County – 13%; Robeson County – 12.9%; and Halifax County – 12.8%.